The lunar eclipse in January, like the lunar eclipse a mere year ago, will be large and bright. It will be a super moon (a little closer to the earth) and, if the evening is clear, should be easily viewed from anywhere in the Americas, lasting for about three hours in total, the peak time will be 5:13 UTC. That adjusts to a little after midnight on the East Coast on January 21, and a little after 9 pm on the West Coast, January 20th. The eclipse, being total, will be a Blood Super Moon, which, in truth is more copper in color, than red. But the change of colors is always a spectacular vision, when we get the chance to watch it occur. This lunar eclipse is in the saros series 134, which originated April 1, 1550 (calendar corrects to April 11, 1550). The Moon's original placement was Libra, 20 degrees 56 minutes, ruled by the planet Venus, over relationships and harmony. The decan and duad placement are both ruled by Mercury, adding logic and practicality to the influences of the original series chart. These influences carry over to the subsequent eclipse events for hundreds of years. This eclipse series in part of the second nodal family of eclipses, of which there are 19 families. This eclipse is the last of the second nodal family and we will not see this eclipse family again for about 18 years. Unlike a solar eclipse, we do not need any special eye protection to watch a lunar eclipse. Go outside and look to the sky in your location, where ever it is night during the time of the eclipse. Use this handy dandy time adjustment to see what time the eclipse will peak in your time zone. Western Hemisphere (Americas) uses the minus (-) option with the dropdown hour adjustment. PST is -8, EST is -5. 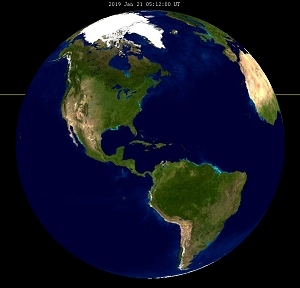 GMT uses the UTC +0, and the rest of the Eastern Hemisphere will use the plus (+). For example, Guam's Standard Time (GST) would use +10. This T-square full moon/lunar eclipse in Leo to Uranus in Aries is not as powerful as it could be, but is plenty strong enough to shake us off our base. Anytime planets newly ingress over the cusp of the sign, there is a bit of a jarring impact from the change. Although this square is not an "in sign" square, Uranus is, in fact, transiting direct motion again, and pulsing back over recent rocky territory heading towards the sign of Taurus, once again. The interesting traits of the full moon in Leo, is that, as the Sun moves through Aquarius, we tend to be reminded that the act of being balanced, is not fixed in the moment, but urges us to readily move on as necessary. Aquarius as the Fixed Air sign and Leo as the Fixed Fire sign can make quite the combustible duo. When we fuel it with Uranus in a Fire sign, the potency of the Moon's placement is expanded. It would not be surprising if there are some natural disasters leading into and beyond this eclipse that force significant transition for many people. For all intents and purposes, each of the significant planets in this chart are being pushed by other planetary aspects. Let's start exploring those. Mercury in Capricorn is also square to Uranus in Aries. This is considered an "in sign" square, which is more potent than an "out of sign" square. Mercury's transit through Capricorn encourages us to solve problems via practical application. This transit can (and does) become quite wearing on us. We are a bit more prone to bouts of depression, possibly because we feel overwhelmed with too many problems or too many options. Mercury is sitting in the middle, today, between the Sun in Aquarius and Pluto in Capricorn. We are quick to see the facts and able to see right through those who are trying to scam us or attempting to pass along false information. Now can be a good time to confront it and/or step over those who attempt to manipulate us with their bogusness. A lunar eclipse is an excellent opportunity to release situations that are unnecessary or holding us back. Venus in Sagittarius is moving into a conjunction with Jupiter, while trine to Mars in Aries. We can look around us for ready support by those who love us, and others who endorse our beliefs. Just don't go overboard with all the love, as it is merely temporary in nature. Use it as a boost to get back on track, but the sustainability of it comes from within. Venus and Jupiter are also square to Neptune in Pisces. This can be one of those moments in time where our past meets our future. We may need to navigate through a few old haunting memories that have yet to be resolved. If we feel caught in an undercurrent of remorse, now is the best time to seek out professional assistance to meet the fears, head on. As mentioned, Mars is in Aries. Mars rules Aries. As the Warrior planet, it can kick up quite a bit of red fiery dust while transiting through its home sign. Our impulses can get the better of us. Be prepared to pay for the consequences of our actions. Mars in moving over a critical degree, adding to the fire influences. This critical degree is ruled by the Sun/Leo which indicates that we are inspired by our heart, and definitely not our "gut" or our "mind." As such, we may react without forethought and without intuition. We may jump from a bad situation, into a worse situation. Mars is square with Saturn in Capricorn which is also transiting over a critical degree that has a tendency to highlight selfishness and materialism. The nutshell of this aspect is that our frustrations may evolve into bitterness, blocking us from finding positive outlets. The Saturn transit in Capricorn is also sextile to Neptune in Pisces. As a result, we should use this aspect for good, while working behind the scenes. Unfortunately, with Saturn's transit over the critical degree, it tends to load us with more selfish and pessimistic traits. We may try to use Neptune's aspect in a selfish back-door type of way. Remember, if we are feeling so inclined, this means that others, too, are feeling this way. Selfish, spiteful actions do tend to catch up with us, at some point. That is pretty much it for the aspects in this Lunar Eclipse Chart. While it feels like an overwhelmingly difficult series of challenges for us to navigate, we need to remember that this chart is encouraging us to release and move on. At times, we need to receive a body slam in order to get us to move off our perception of a sound base, and move on to the next phase of our lives. The indicators that this rough transition is for the better, are all there. The receptive placements in this chart are balanced between masculine and feminine. This is a good signal that the changes we are encountering are going to be productive ones. While there are more Fire Element placements, it is not so heavy that we can't adapt with logic and wisdom. It's more of a "time to move on" indicator, and not a "we are all doomed" one. The planets situated in the Qualities throughout the chart are also fairly balanced. So we have the potential to deal with the changes, once we accept that there is a need for change. The capacity to be centered where you are at the moment, and yet prepared to move on if necessary, can be acquired with practice.